Our current team of agents are on a mission with lofty goals. Every one is happy to be a part of something successful, with ambitious REALTORS. Reliable careers comes with a supportive group like we have here. 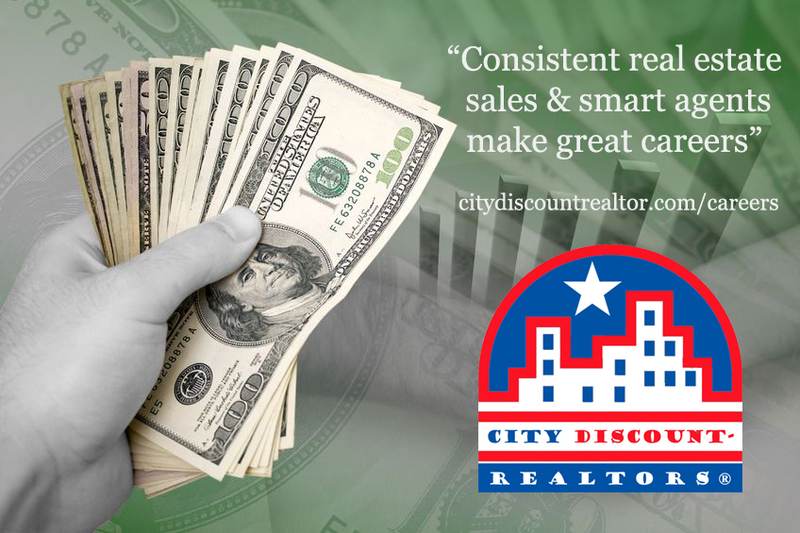 City discount -REALTORS® is a branch office of Original Discount LLC. To find your niche with our real estate network, see our Career’s page. We take less money from our clients, and less money from you. A winning strategy, which creates long lasting careers. *E&O and transaction fees explained in fee addendum. Two family transactions allowed per year at 90/10 split for mentor and Independent plans. See broker for details. The ‘Mentor plan’ is meant for new Agents, or Agents that need fresh direction in real estate sales. Are you coach-able? Having a successful Agent as a mentor/coach is necessary to help find your path to consistent real estate closings. Agents are required to complete at least 6 real estate closings with an approved mentor; before being considered for any other compensation plan. The ‘Leads plan’ is meant for ambitious, relatively experienced Agents with proven sales experience and at least 2 years of licensing. You’ll need to be dedicated to a full time real estate career, and efficiently follow up with prospects, acquire clients, and successfully close real estate deals. Agent earns 75% compensation on sale transactions and 100% compensation for lease transactions; earned compensation splits are only calculated after broker has deducted any E&O fees, transaction fees, or any special expenses due from agent and plan. The ‘Independent Plan’ is for Agents who are business independent, and do not need mentoring or help with finding leads or running a successful real estate business. This is a popular plan for experienced part time Agents. You must be licensed for at least 5 years. before being considered for this plan. The ‘Veteran Plan’works well for Independent Agents predicting 5 or more sale closings a year. You must have at least 9 active years of real estate licensing up until application date. A yearly upfront Firm fee of 949$. Successful careers in real estate happen for people who actively improve and practice the characteristics listed above.